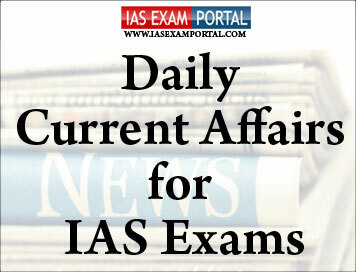 Current Affairs for IAS Exams - 12 APRIL 2019 | IAS EXAM PORTAL - India's Largest Community for UPSC Exam Aspirants. Mr Naidu said, India’s banking sector is poised for robust growth as the rapidly growing business and commerce in India would turn to banks for financial services. India is concerned about the “threats” it faces in space, the Pentagon has said, defending the country for acquiring anti-satellite (ASAT) missile test capabilities. After India’s test, NASA termed as a “terrible thing” the country’s shooting down of one of its satellites, saying it created about 400 pieces of orbital debris, endangering the the International Space Station (ISS). “So, they had something in low earth orbit. They used an anti-satellite weapon to down, and it resulted in - the estimate’s right now 400 pieces of debris, 24 which are large enough to potentially pose a threat to the International Space Station,” he said. “There have been other instances like this. There was a Chinese - a similar effort in 2007 that led to the catalogued 100,000 pieces of debris, many of which are still observing in debris fields that pose danger to other assets in space,” he said. What should the rules environment be, and what should we be doing to try to promote rules? India is an ally. We’re not talking about an adversary doing something. We’re talking about them testing some capacity, but then that creates challenges for all kinds of uses of space. How should we be solving problems like that?” Mr.Kaine asked. In the ongoing Cologne Boxing world cup in Germany, four Indian women boxers have confirmed 4 medals for the Nation in the tournament. Last night, Commonwealth Games bronze medallist Pinki Rani and reigning youth world champion Sakshi assured India of two medals by entering the semi-finals scheduled later today. The India Open gold medallist Pinki Rani defeated Thailand's PhunsangCahiranchaya 5-0 in the quarter-final bout in 51 kg category.The 18-year-old Sakshi won in contrasting fashion as she faced some stiff resistance from CecilleKelle of Denmark in 57 kg category. The Indian contingent has already been confirmed of at least a silver and a bronze after MeenaKumariMaisnam entered the 54 Kg finals and PwilaoBasumatary reached the 64 Kg semi-finals .